« Low Fat Peanut Butter…a new food addiction. Here is a slimmed down recipe that even my husband enjoys! While neither of us are big fans of ground turkey, every now and then I come up with a perfected dish using it. These meatballs are a prime example. They are great in spaghetti or meatball subs or you could even serve them as an appetizer with a sweet & sour sauce. Typically, I make them with spaghetti and since this is a “slimmed down sensation”, I’ll be including the whole spaghetti & meatballs recipe, but you can use these however you like….and probably most people won’t even notice that they’re turkey. As a matter of fact, I made a big pot of these to take to a potluck party and no one knew they were turkey. The only reason I even decided to use turkey was to accommodate one of my friends who does not eat beef or pork…and she kept asking me “are you sure these are turkey?” I got lots of compliments and have kept these in my dinner rotation ever since (especially once I got the approval of The Hubby!). These meatballs freeze really well and now that I am being a good little dieter and following appropriate portion sizes…I vacuum seal 4 meatballs in a bag (using my Food Saver), freeze them and use them as needed. I find that if I make more than one serving I am too tempted to munch on them, since they are small in size. Of course, if you are not concerned with portion control you can (A) make them any size you want & (B) eat as many as you want! 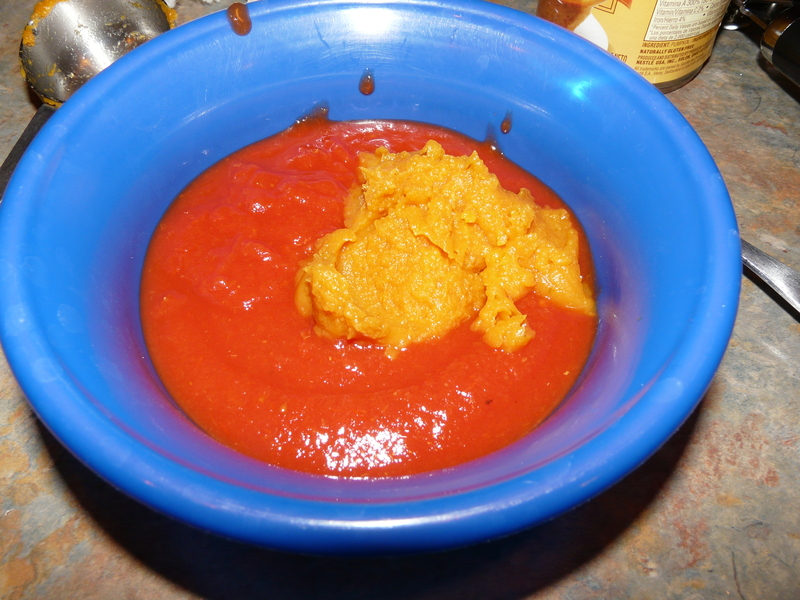 As for my slimmed down sauce, I use canned crushed tomatoes (I hate chunks of tomatoes in my food! Just one of my weird eating quirks) and to make it thicker I add canned pumpkin. This helps to add some substance to the sauce plus pumpkin is very low in calories and has no fat, is rich in vitamins and anti-oxidants and is a good source of fiber. I know what you are thinking…pumpkin?? But trust me when I tell you that you won’t even know it is in there…you can’t taste it, smell it or see it. I am an extremely picky eater, which makes dieting even more of a challenge for me, so this is definitely a good find for me. Adding the pumpkin also makes you feel more satisfied than just using the crushed tomatoes for your sauce. In the recipe, I’ll list the herbs & spices I use to spruce up the tomato sauce, but like I always say the best recipes are ones you can change to meet your own preferences. I sometimes also add frozen chopped spinach to get more veggies and make it even more filling. 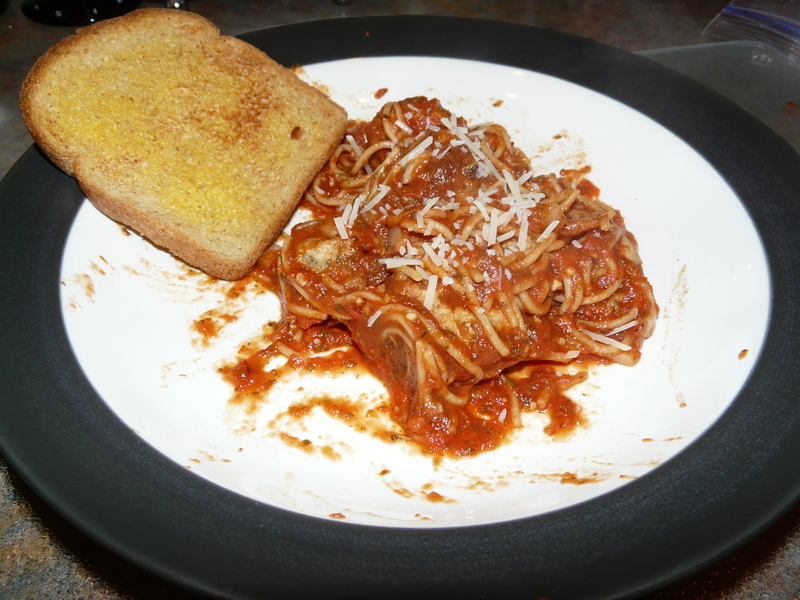 For the pasta I use whole wheat thin spaghetti, about ½ cup cooked. For those of you following “Weight Watchers Points Plus”, the meatballs should be made very small (about 1”) and you should get 28 meatballs. Meatball recipe makes 7 servings. Tomato Sauce recipe makes 2 servings. Roll into 1” balls (you should get 28 meatballs). Bake at 350 degrees for 20-25 minutes or until cooked through. In a small saucepan, mix tomatoes and pumpkin until well combined. Add remaining ingredients and heat over low heat for a few minutes or until heated through. If using meatballs, add to sauce and simmer for a few minutes. 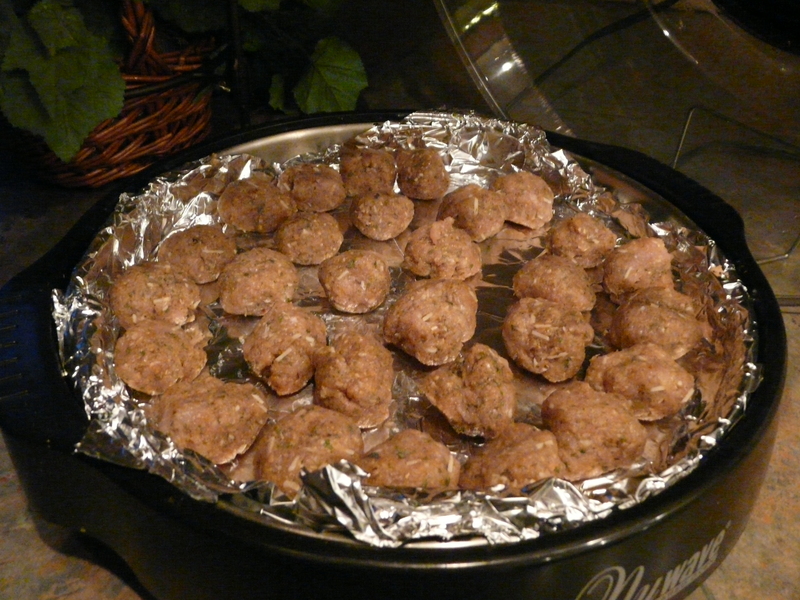 If meatballs are frozen, add to sauce and allow to cook over low heat until the meatballs are reheated. 3. Serve with ½ cup cooked whole wheat spaghetti. Interesting to use pumpkin in the sauce! Great tip! Thanks! As a picky eater I need to try to get in fruits & veggies anyway I can.